What’s New With Psoriatic Arthritis? Psoriatic arthritis (PsA) is a somewhat underrepresented form of arthritis in most rheumatology practices. However, it seems to be almost as, if not more, prevalent than rheumatoid arthritis (RA) in some cases. 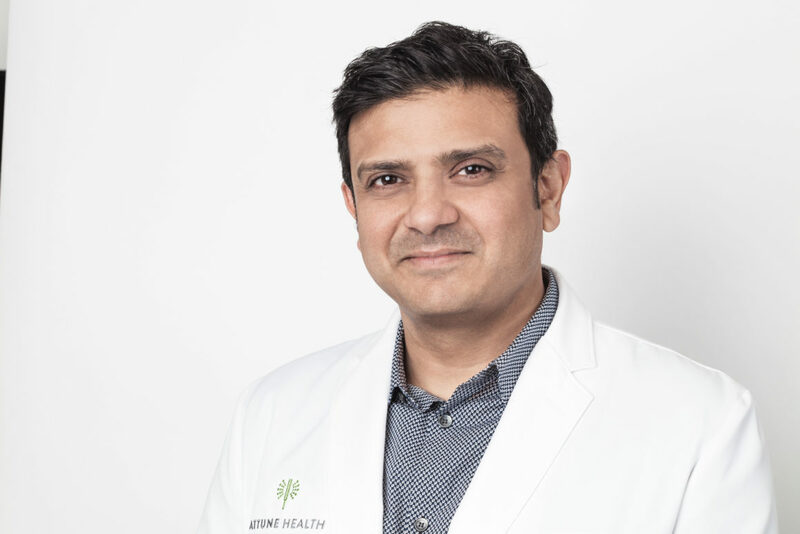 Attune Health founder and rheumatologist Dr. Swamy Venuturupalli breaks down our current understanding of PsA, as well as existing treatment options and the cutting-edge research being conducted in our very facility. Symmetric Arthritis: affects the same joint bilaterally, and can resemble RA. Asymmetric Arthritis: can occur in any joint, but not necessarily the same joint on both sides of the body. Distal Interphalangeal Predominant (DIP): involves the joints of the fingers and toes close to the nails, and is often associated with nail changes. If you or any of your friends have psoriasis and arthritis, it is important to contact your physician to be referred to a rheumatologist for a diagnosis. One interesting thing about psoriatic arthritis is that it is often associated with metabolic syndrome, which occurs when the metabolism of the body is abnormal. Patients with this condition generally have obesity, elevated triglycerides, elevated lipid profiles, as well as elevated blood sugars and uric acid levels. The exact reason for why psoriasis and metabolic syndrome coexist is unknown, but it definitely is a complicating factor in the treatment and management of patients with both psoriasis and psoriatic arthritis. The good news is that there are many treatments available for psoriasis and PsA. For example, a lot of patients generally get treated with methotrexate. Additionally, TNF blockers are extremely effective for both the skin and the joint disease, and have been in the therapeutic paradigm for several years. A recent study presented at the American College of Rheumatology (ACR) annual meeting in 2018 showed that there was not much difference between Enbrel, a common TNF blocker, monotherapy and methotrexate monotherapy, though these differences were still considered to be statistically significant. Moreover, the combination therapy did not seem to add much relative to monotherapy in isolation. Thus, methotrexate is a reasonable treatment option. In addition, there are several other medicines that can be used for PsA and psoriasis, including Stelara or Ustekinumab, which works on the cytokines IL-12 and IL-23 that are instrumental in the pathology of PsA. Another drug class is anti-IL 17 therapy, which includes the drugs Taltz (Ixekizumab) and Cosenytx (Secukinumab). While the molecule Otezla has been found to be effective for both psoriasis and PsA, its effect on PsA was unfortunately more mild. This is an interesting molecule because, unlike other drugs, it is not immunosuppressive and works as an inhibitor for the phosphodiesterase 4 system. Of note, it is also an oral drug. Lastly, JAK inhibitors such as Xeljanz (Tofacitinib) seem to have an effect on PsA. Attune Health is pleased to inform you that we are performing advanced research studies on PsA in our facility. For instance, we are studying patients with PsA using ultrasound technology to measure disease activity and also collecting synovial biopsy specimens to understand the basic mechanism of the disease. Furthermore, we are also trying out some of the advanced Biologic therapeutic options such as Cosentyx for PsA. If you have any further questions about the clinical trials or would like to refer a friend or a family member, please give us a call at (424) 666-2653 or email [email protected].